Description: Although Gilles Deleuze is one of France's most celebrated twentieth-century philosophers, his theories of cinema have largely been ignored by American scholars. 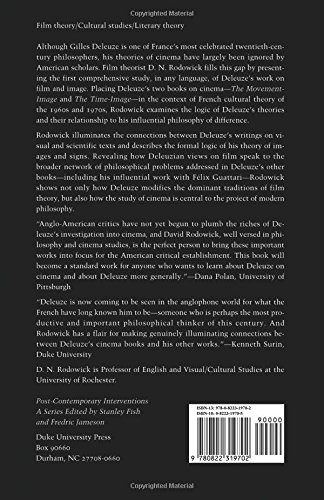 Film theorist D. N. Rodowick fills this gap by presenting the first comprehensive study, in any language, of Deleuze's work on film and images. 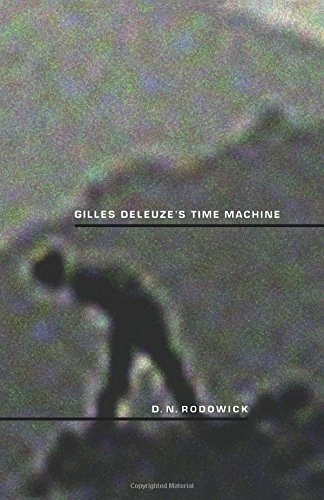 Placing Deleuze's two books on cinema-The Movement-Image and The Time-Image-in the context of French cultural theory of the 1960s and 1970s, Rodowick examines the logic of Deleuze's theories and the relationship of these theories to his influential philosophy of difference. Rodowick illuminates the connections between Deleuze's writings on visual and scientific texts and describes the formal logic of his theory of images and signs. Revealing how Deleuzian views on film speak to the broader network of philosophical problems addressed in Deleuze's other books-including his influential work with Felix Guattari-Rodowick shows not only how Deleuze modifies the dominant traditions of film theory, but also how the study of cinema is central to the project of modern philosophy. Author Biography: D. N. Rodowick is Professor of English and Visual/Cultural Studies at the University of Rochester.